The book is split into 2 novellas. Up in Flames is about the first third of the book, with Caught in the Act taking up the rest. Up in Flames-Melanie and Adam went to high school together. She was a rich girl, he was poorer than dirt. Although they both were attracted to each other during school, neither made a move. Now, years later, they find themselves on the same party boat. When they go overboard during a storm and end up stranded on an island, things really start to heat up. I will be honest and say that I love the whole stranded together on a deserted island plot line. That’s pretty much a sure fire way to get me to read a book. And this one did not fail to dissapoint. Caught in the Act-Mick, a police officer, has fallen for a lady he’s never met. He’s seen her jogging before and just knows he needs to meet her so he follows her into a jewelry store. When the store is robbed, he protects Delilah and takes a bullet. Delilah offers to let him recover at her place. And while he does need time to recover, he’s also beginning to suspect that someone is after Delilah. So he moves in with her to keep her safe. Caught in the Act had just the right amount of suspense for me. Delilah is such a unique character and Mick accepts her for what she is. There was a lot of secret keeping, especially on Mick’s side, that I didn’t appreciate, but otherwise I enjoyed this one a lot. 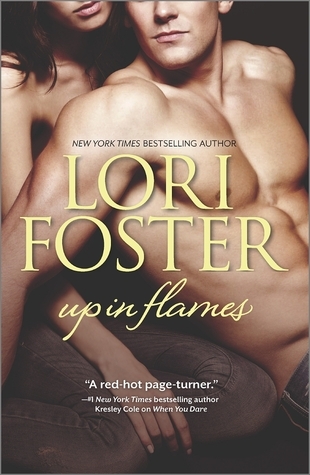 This is the first book I’ve read by Lori Foster but I’m looking forward to checking out her back list. I especially want to see if there are stories for the secondary characters (Mick’s friends) from Caught in the Act. The combination of these 2 novellas made for a quick and enjoyable read. Fast paced and engaging, I did not want to put this one down. At one point I found myself mad at my 7 year old who interrupted reading to ask when supper would be. Then I looked at the clock and discovered that it was already 7:30pm.